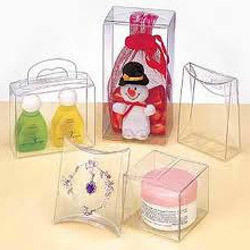 We are the leading trader and supplier of Rigid PVC Boxes. Clients can avail these products at market leading prices. Established in the year 1993, at Delhi (India), we, “Bahubali Trading Corporation” is engaged in Trading, Wholesaling, Retailing and supplying an array of Acetate Boxes, PP Sheets, Rigid PVC Film, etc. Apart from this, we also offer Rigid PVC Film, Calendared Rigid PVC Film, PET Sheet, Acetate Boxes, Blister, PP Sheets, etc. We are one of the leading dealers and stockist of Rigid PVC, PP and PET Films.Our main focus is delivery as per schedule. We put great emphasis on a strong relation with our esteemed Customers, which is the nucleus of a successful partnership. In our drive to excel & reach the zenith, we constantly strive to bring innovative & novel products to the market. Our product range includes a wide array of films like PVC (Rigid & Soft), Plastic Packaging Materials, PVC Sheets for manufacturing Blisters, Transparent Boxes Plastic Cards, Blank Cards, Dye Sublimation Machines etc. We do believe in straightforward and honest dealings. We believe in slow, steady growth and give the most reasonable and fair transactions to our customers. We have always gained customer’s trust with our dealings and always look to our customer’s gaining more and more profit from us. Bahubali Trading Corporation is a pure marketing and distributing concern of high quality PVC Film. Our strength as a distributor is the combination of quality and service that we provide. We have chosen to work with only the best manufacturers of the products we distribute.